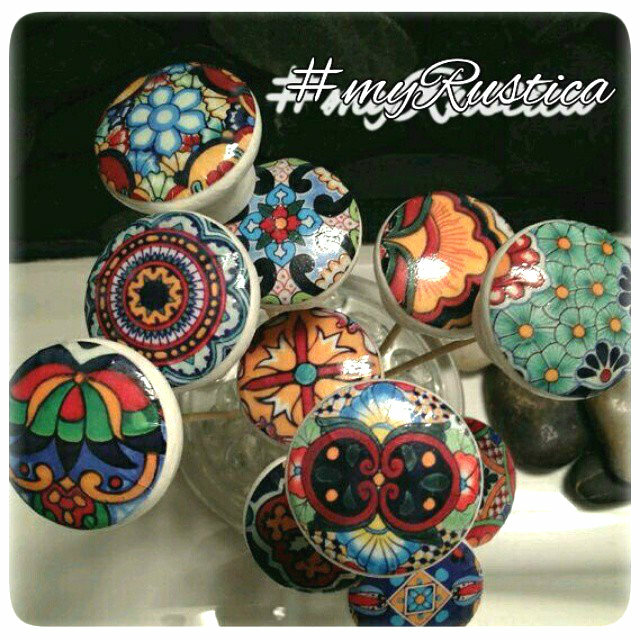 Handmade pull knobs from Mexico are decorative and elegant at the same time. They are an excellent idea for creating unique home accents. Pull knobs with painted handles add southern Mexican flavor to the home decor. Use them for kitchen and bathroom cabinet doors, and drawers. Rustica House decorative pulls are furnished with a long screw allowing mounting them on the cabinets. They are hand painted with many mexican colonial, Spanish hacienda, rustic and folk art patterns on various backgrounds. Often, cobalt blue, yellow, orange, green and red colors are used for decorating ceramic talavera. Decorative pull knobs are vivid and contrasting.